Dozens of staffers and a handful of ex-members have taken their congressional expertise to lobbying shops, industry groups or public relations firms since Election Day 2018. The moves are part of a longstanding trend, said James Madison University’s Tim LaPira, a political science professor who studies the interplay between government and the private sector. “It looks like 40 or 50 percent of the people who leave the Hill will end up in a lobbying, government relations, or related position,” LaPira said in an interview. Lobbyists with government experience earn four times as much as those without those credentials, according to LaPira’s research. 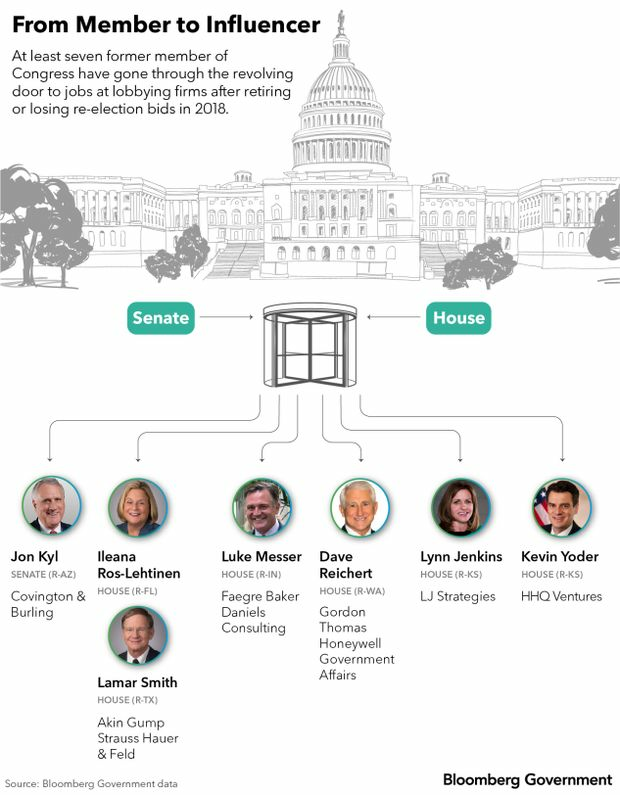 Republicans, who lost the most seats, dominated the first wave of post-election hires, according to data compiled by Bloomberg Government from Lobbying Disclosure Act filings and company announcements. LaPira predicted that will change. 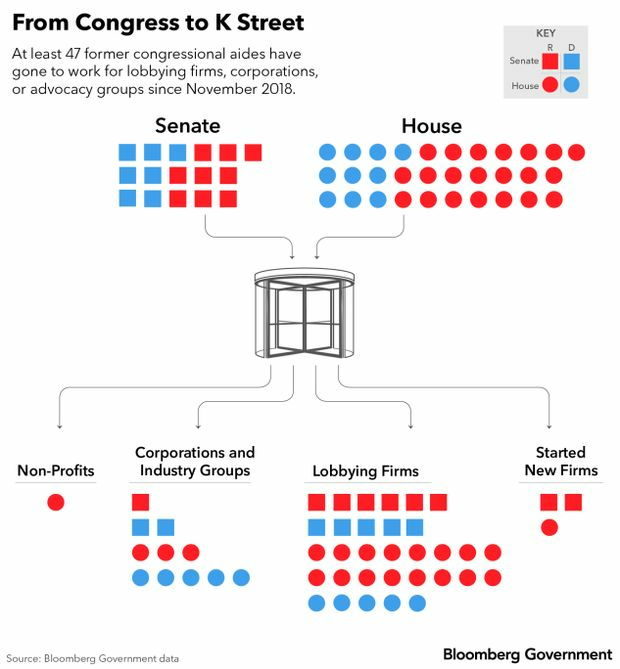 While most of the movement was from Capitol Hill to K Street, a few lobbyists moved in the opposite direction, taking jobs on congressional staffs. And Van Hilleary, a former Republican House member from Tennessee, made an unusual round trip, from member of Congress to lobbyist to congressional chief of staff. Akin Gump Strauss Hauer & Feld hired Casey Higgins, who had been a senior aide to former Speaker Paul Ryan. She had advised Ryan on policy issues and trade counsel. She also served as the key liaison between the Speaker’s office and the Obama and Trump administrations, in addition to House and Senate leadership. Bramer Group brought on Cody Hoefer, who previously served as the national defense and military policy adviser to recently defeated Rep. Steve Russell (R-Okla.). Brownstein Hyatt Farber Schreck has brought on Jerome Murray. He most recently worked as the chief of staff to Stacey Plaskett (D-V.I.). The firm also hired Republican Ari Zimmerman, who most recently was on the House Armed Services Committee professional staff. Capitol Hill Consulting Group has added Luis Baco, the former top aide to Puerto Rico’s non-voting congressional delegate,Resident Commissioner Jenniffer González Colón (R). Cassidy & Associates hired Kelley Hudak from the office of House Minority Whip Steve Scalise (R-La. ), where she served as coalitions director. Cavarocchi Ruscio Dennis Associates hired Brian Waldrip as a senior vice president. He most recently was on the House Transportation Committee staff and had been the legislative director to ex-Rep. John Mica (R-Fla.) for more than a decade. Cornerstone Government Affairs brought on Mike Goodman, former chief of staff to Rep. Ron Kind (D-Wis.), and Claire Burghoff, who most recently was the GOP communications director for the House Budget Committee. Covington & Burling added Samantha Clark to its Washington office, where she will work in multiple practice areas including the public policy and government contracts practices. She has held several top roles on the Senate Armed Services Committee, most recently serving as deputy staff director and general counsel for the panel’s Republicans. Definers Public Affairs added Antonia Ferrier, who was as a communications adviser to Senate Majority Leader Mitch McConnell (R-Ky.). Duberstein Group hired Kate Winkler Keating, who was chief of staff to former Rep. Joe Crowley (D-N.Y.). Forbes Tate Partners has hired three people from Capitol Hill: Francesca McCrary, Megan Taylor and Ryan McConaghy. McCrary most recently worked for Rep. Elijah Cummings (D-Md.) and was responsible for his committee’s health care portfolio when he was ranking member on the House Oversight and Government Reform Committee. Taylor was communications director for former Sen. Dean Heller (R-Nev.). McConaghy was a senior adviser Senate Minority LeaderChuck Schumer (D-N.Y.). FP1 Strategies brought on Chris Bond, who most recently was Scalise’s communications director. FTI Consulting hired Frederick Hill,who spent the last four years as the communications director for Senate Commerce Committee Republicans. Before that, he worked at the House Oversight and Government Reform Committee for 13 years. The Herald Group brought on two former House aides: Keeley Christensen, former deputy communications director for the House Financial Services Committee Republicans, and Nick Petromelis, who had been a legislative fellow for Rep. Joe Wilson (R-S.C.). Holland & Knight added Christopher Armstrong as a partner. Armstrong had been an oversight counsel for the Senate Finance Committee and held a similar role at the House Ways & Means Committee. Invariant hired Lindley Kratovil Sherer, ex-chief of staff for Rep. Elise Stefanik (R-N.Y.). Her resume also includes working for retired Rep. Todd Rokita (R-Ind. ), Rep. Scott Tipton (R-Colo.), and in the George W. Bush administration. KPMG hired Adam Wolf as a director of government affairs. Wolf was chief of staff to former Rep. Carlos Curbelo (R-Fla.). National Environmental Strategies has recruited Cody Stewart, the former staff director for the House Natural Resource Committee Republicans. S-3 Pubic Affairs recruitedformer Democratic leadership aide Kevin Casey to the firm. Casey most recently worked as the policy director for the House Democratic Caucus. Signal Group added Charlie Moskowitz and Mae Stevens. Moskowitz’s resume includes working as a senior policy counsel to the Democrats on the Senate Homeland Security and Governmental Affairs Committee. Stevens most recently served as an environmental policy adviser to Sen. Ben Cardin (D-Md.). Strategic Marketing Innovations hired Jeremy Steslicki from the office of Sen. Tammy Baldwin (D-Wis.), where he was national security adviser and director of appropriations. Subject Matter recruited Natalie Rogers, who was chief of staff to Sen. Cory Gardner (R-Colo.),and formerly worked for the House Republican Study Committee. Venable brought on Nick Choate, who had been deputy legislative director to former Sen. Claire McCaskill (D-Mo.). Venn Strategies hired Andrew Block, who was counsel and senior legislative assistant to ex-Rep. Mike Bishop (R-Mich.). Winning Strategies Washington has added Nancy Fox as a principal. She had been the staff director for the House Appropriations Committee Republicans. Two top Senate Republican leadership staffers formed a government affairs and consulting firm called Marshall & Popp. Hazen Marshall was policy director for McConnell, and Monica Popp was the chief of staff to Sen. John Cornyn (Texas). A former House Republican chief of staff, Clark Fonda,has launched Fonda & Associates. He was the top aide to former Rep. Robert Pittenger (R-N.C.). EveryLife Foundation for Rare Diseases named Steve Silvestri as director of public policy. He was a legislative assistant to former House Appropriations Chairman Rodney Frelinghuysen (N.J.). Amazon Inc. hired Tina Tower, who most recently worked in the office of Sen. Ed Markey (D-Mass. ), as its program manager for U.S. public policy. The tech giant also brought on two former House aides to work on diversity issues: Troy Clair, former chief of staff to Rep. G.K. Butterfield(D-N.C.) and LaDavia Drane, former chief of staff to Rep. Yvette Clarke (D-N.Y.). The American Council of Life Insurers (ACLI)has named Joyce Meyer as its executive vice president of government relations. She was a senior adviser to Ryan and worked in the Trump White House. Meye begins her new role on Jan. 31. The Bank Policy Institute hired Fabrice Coles to serve as its vice president of government affairs. She most recently worked as the executive director of the Congressional Black Caucus. Coles starts in February. CoreLogic Inc.added former Democratic aide Chay Halbert to its lobbying shop. He came from the office of Rep. Mark Takano (D-Calif.), where he worked as a legislative assistant. Facebook Inc. brought on Matt Schumacher to handle government outreach for the social media network. He previously worked as digital director to the House Democratic Caucus. The Managed Funds Association hired former Ryan aide Mark Epley to serve as executive vice president, managing director and general counsel. He’ll begin the job in February. Epley had been Ryan’s general counsel and previously was a House Ways and Means Committee staff attorney. TheNational Association of Manufacturers has added Sam Beaver, formerly policy adviser for Cornyn, as director of government relations. The group’s new senior director for tax policy, David Eiselsberg, had been chief of staff to former Rep. Sam Johnson (R-Texas). The U.S. Travel Association has named Treon Glenn as its senior director of government relations. He had worked for former Sen. Bill Nelson (D-Fla.). Former Rep. Lynn Jenkins (R-Kan.) launched her own firm, LJ Strategies. Akin Gump brought on two House chairmen who retired at the end of the 115th Congress: Former Foreign Affairs Chairwoman Ileana Ros-Lehtinen (R-Fla.) and former Science, Space, and Technology Chairman Lamar Smith (R-Texas). The firm said that they intend to eventually work as lobbyists. Covington & Burling hired back former Sen. Jon Kyl (R-Ariz.) after he had left to temporarily fill the seat left open by the late Sen. John McCain (R-Ariz.). Faegre Baker DanielsConsulting hired former Republican Policy Committee Chairman Luke Messer (Ind.) to serve as a principal in its Washington office. Gordon Thomas Honeywell Government Affairs brought on former Rep. Dave Reichert (R-Wash.), and his chief of staff, Sue Foy. Former Rep. Kevin Yoder (R-Kan.), has joined HHQ Ventures, a lobbying firm run by former Rep. Ben Quayle (R-Ariz). Former Rep. Van Hilleary (R-Tenn.) has left the law and lobbying firm Dentons to become the chief of staff to freshman Republican Rep. John Rose (Tenn.). John Keast, a former principal and director at Cornerstone Government Affairs, was tapped to serve as the GOP staff director of the Senate Commerce Committee. Prior to joining Cornerstone, was chief of staff to then-Rep. Roger Wicker (R-Miss.). Catherine Kuerbitz has become a legislative assistant for Rep. David Scott (D-Ga.). She had been a lobbyist for the Small Business Investor Allianceand previously worked at the lobbying firm Eris Group. She had worked in the office of former Sen. Kay Hagan (D-N.C.). Lane Lofton has been hired as chief of staff for freshman Rep. Joe Cunningham (D-S.C.). Lofton previously was vice president of government relations at NCTA – The Internet & Television Association. He had worked on Capitol Hill as a legislative assistant. Jeff Rustvang, the former government affairs manager at the U.S. Beet Sugar Association, is now the state director for freshman Rep. Kelly Armstrong (R-N.D.). The post Aides And Ex-Lawmakers Found Fast Post-Election Lobbying Jobs appeared first on Bloomberg Government.